Headquartered in Wendell, N.C., Kioti Tractor, a division of Daedong-USA Inc., is a market-driven company that has been supplying tractor models in the 22- to 90-hp range to the U.S. and Canadian markets for 30 years. Building on the company’s core product line and history, Kioti introduced the Mechron 2200 utility vehicle (UTV) into the market in 2011. 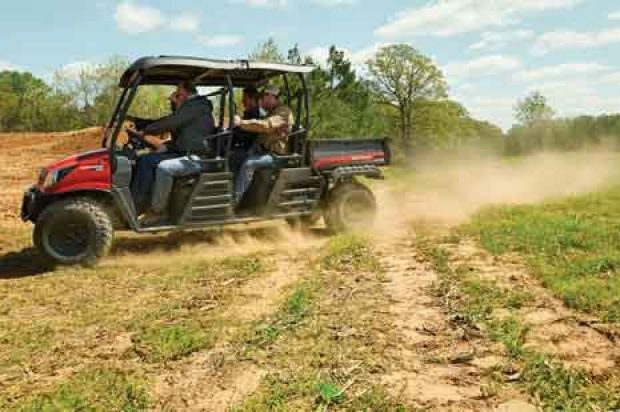 After much success, Kioti revamped and expanded their UTV offering in 2015 with the addition of two new models, including a two-row model. Whether you need a worker on the farm or a way into the woods, all three Kioti Mechron models get the job done. With four-wheel, fully-independent, rear dual A-arm suspension and front MacPherson type suspension, the wide track offers increased stability and a smooth ride on even rough terrain, says Kioti. The tight turning radius and rear anti-sway bar provides cornering and handling. Furthermore, the Mechron features the widest cargo bed in its class, excellent payload capabilities, 1,300 lbs of towing capacity and a steel frame construction for increased agility and maneuverability. Powered by a 22-hp Daedong diesel engine, continuously variable transmission and a time proven Daedong gearbox with two speeds (Hi/Lo), the Mechron simply translates power into performance, says Kioti. The Kioti Mechron 2200 and the Mechron 2200PS provide a wide and flat walk-through design and comfortable seating for up to three passengers, offering excellent leg and foot room for easy entry and exit. Each of these two models boasts more than 112 in. in length and 60 in. in width and are equipped with true hydraulic-assisted rack-and-pinion power steering and a standard heavy-duty brush guard. The Mechron 2240 is as tough, dependable and fun as its predecessor but with twice the room. This newly designed UTV features two-row bench seating with a hinged front row seat perfect for extra storage. The model’s standard 2-in. rear hitch receiver enables users to attach a trailer and receiver-equipped implements with ease. And for easy placement of loads, users can opt for the hydraulic dump kit. Wide ranges of options are available for the Mechron including a sun canopy, front hitch receiver, rear screen kit, windshield, work lights, fog lights and suspension dust guard kit. Attachments and implements include a pull-behind spreader, wire unroller, eight-blade disc harrow with a culti-packer option, flip discs, field option cabs and chain harrows. For more information, visit kioti.com.